What It’s About: The history of surfing, from its origins to the modern-day. Why Watch it Today? : Duke Kahanamoku, winner of Gold and Silver medals in the 1912, 1920, and 1924 Olympics, was born today in 1890. Duke popularized and spread the sport of surfing by demonstrating it during his international swimming exhibitions. Riding Giants is one of those documentaries that you stumble upon but just can’t help watching. Skateboarder turned filmmaker Stacey Peralta draws you in with great editing, interesting talking heads, a real sense of getting to know the people profiled, and, most importantly, some of the most amazing footage you will ever see. 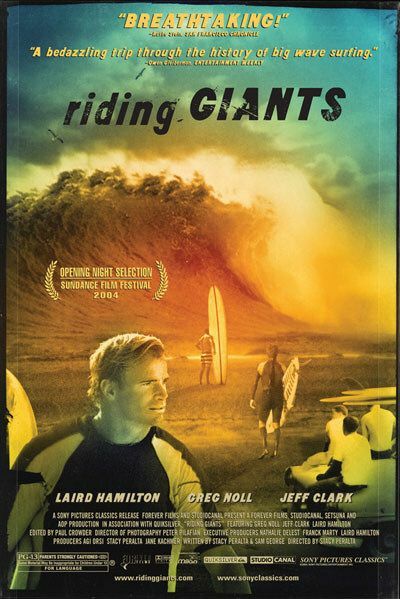 This entry was posted in Documentary, Indy, Movie of the Day, Sports and tagged California, Gerry Lopez, Greg Noll, Hawaii, Jeff Clark, John Milius, Laird John Hamilton, Stacey Peralta, Studio Canal, surfing.